This is a story I wrote for Wards Auto. Reposting here. The media writes about China’s NEV policy is such a shallow way. For example, I didn’t even get into it here but the whole eight percent requirement for automakers doesn’t really mean eight percent of all the cars they produce. There are “multipliers” applied to the PEVs and fuel efficient models produced that mean one BEV, for example, will count for more then one unit. Like California’s ZEV rules, however, trying to understand China’s policy would make my head explode. Also, as I note in this story exactly what the policy will be is as yet undecided. SHANGHAI — China wants electric vehicles to account for a significant portion of the vehicles sold in this country in the future, and it wants automakers to produce a growing number of those vehicles. That much is clear. What isn’t so clear is exactly what the market wants, and what the policies related to EV production will be. That forces automakers to adopt somewhat unfocused future product plans. Take Ford Motor Co. It plans to eventually offer electrified versions of every model produced at Changan Ford, its joint venture with Chongqing Changan Automobile Co.
Seventy percent of its models will be electrified by 2025, Trevor Worthington, vice president of product development at Ford Asia Pacific says at the Shanghai auto show. The problem can be knowing just what the right product will be. For example, “I don’t know that anyone understands the Chinese customer (battery) range demands,” Worthington says. Just before the April show, Ford announced it would begin producing a plug-in hybrid vehicle, the Mondeo Energi, at Changan Ford in 2018. It will also bring to market within five years an all-new fully-electric SUV with a range of more than 450 miles, Ford announced. Ford Mondeo Energi PHEV will begin production in China in 2018. Then there is the issue of shifting government policies. Sales of battery electric vehicles in China rose 9.7 percent in the first four months of 2017 to 72,895 vehicles. Plug-in hybrid electric sales fell 27.4 percent to 17,507 vehicles, according to the Chinese Association of Automobile Manufacturers. Hefty government subsidies underpinned much of that demand. Chinese drivers haven’t shown any real passion for electric vehicles unless accompanied by cash. But in January, the government announced it will phase out those subsidies. They are expected to be eliminated by 2021. At the same time, Beijing still says it wants electrified vehicles to account for 20 percent of passenger vehicle production and sales in 2025. In place of the purchase subsidies, China’s central government is planning a carbon credits program similar to California’s Zero-Emission Vehicle program. “It is going to shift the burden (for creating demand) to the manufacturers,” he tells Wards Auto during the Shanghai auto show. Auto makers will likely be forced to produce electric vehicles at a loss to meet the government requirements, he says. In theory, the carbon credits the automakers receive will offset the losses, says Robin Zhu, senior analyst in Hong Kong at investment research firm Sanford C. Bernstein. “But you essentially go from a system where there are government subsidies to a system where OEMs cross-subsidize each other via the credits system,” he says. In any case, the policy is likely to change, pretty much everyone agrees. That often occurs here. Indeed, exactly what form China’s ZEV mandate will take is as yet unknown. Two government offices, the National Development and Reform Commission and the Ministry of Industry and Information Technology, have each published their own version. The industry consensus now, says Zhu, is that the EV credits target will be delayed by either a significant phase-in period or lower 2018/2019 quotas. “It is a source of frustration” for automakers,” he says. It’s about time I wrote another ChinaEV blog and given my penchant for revisiting companies I have written about before, I thought battery maker A123 Systems Inc. would be a good topic. I met with A123 CEO Jason Forcier last month during Auto China in Shanghai. The battery maker has been through some big changes since we last spoke, including a bankruptcy filing. But A123 looks to be on a good path now. Forcier says A123 is on a tear nowadays. 48V is its sweet spot. As you likely know, A123 was in January of 2013 acquired by Wanxiang, one of the largest (if not the largest) auto components maker in China. That gave it financial security, but that is not the most valuable benefit of being owned by Wanxiang, as it turns out. Read on to learn more. The battery maker reorganized in February of 2013, says Forcier. “The company has been on a tear since then,” he says. Its 2018 revenue will be close to $500 million, he told me, compared to less than $100 million in 2012. As you might expect given the opportunities in China, A123 is investing heavily in its China footprint, to the tune of $200-250 million a year. That is primarily to support the China market but China is also the base of A123’s battery cell production and it aims to export cells to Europe from China. Though we hear mostly about the BEV or PHEV markets in China, which require fairly large batteries, China is the largest 48V battery market in the world, says Forcier, and half of A123’s 48V battery business globally is in China. 48V batteries are used in mild hybrids – vehicles with start-stop systems – and improve fuel efficiency quite a bit. China is mandating fuel economy of 5.0 liters per 100 K by 2020. “That will be really hard to meet without a battery on board,” says Forcier. The market for electrified vehicles with larger batteries is primarily policy-driven in China. That has meant government purchase subsidies, but those are now expected to be phased out by 2021. Replacing subsidies will be a program resembling California’s Zero-Emission Vehicle policy, which compels automakers to produce and sell a certain number of BEVs/PHEVs. Even with that change, however, China will still remain a huge 48V market because meeting the fuel economy standards will require a mix of engine types. Of course, A123 still serves the larger battery market as well but its main (only) customer is Karma Automotive, which is also owned by Wanxiang. Forcier has some interesting observations on Chinese automakers’ battery technology. They are investing in it, he says, but they are not on the same level as global OEs such as GM or VW. And, “BMW knows way more about batteries than Chinese OEs,” he says. It surprised me a bit that things haven’t changed that much since I started blogging about China and EVs. Sure, the local manufacturers have made great strides in electrification compared to five or six years ago. But, they are still focused on cost, says Forcier. Most aren’t making the R&D investments that the foreign automakers are in battery systems. Instead, they are sourcing entire battery systems out to suppliers, says Forcier. Same old story. Speaking of SAIC, I asked Forcier what became of A123’s joint venture with SAIC called Advanced Traction Battery Systems. “It is doing very well,” he says. “Still producing and growing.” For background of that JV see my blog of March 28, 2012. ATBS is now a captive battery supplier to SAIC. That has really paid off with General Motors, which is one of A123’s best customers, says Forcier. It also doesn’t hurt that A123 has a tech center in Michigan, where GM has a battery plant and its global headquarters. A123 also works with many other global OEs who do business in China. “We booked a lot of business in the last 18 months,” he says. With a lot of business, Chinese certification, and a Chinese owner who is not lacking for cash, Forcier seems pretty satisfied with A123’s situation. The Chinese certification is really A123’s ace in the hole, it seems. “We get calls from our competitors all the time because they are locked out” of the China market, he says. China considers combining carbon credits and CARC in one policy — what could go wrong? 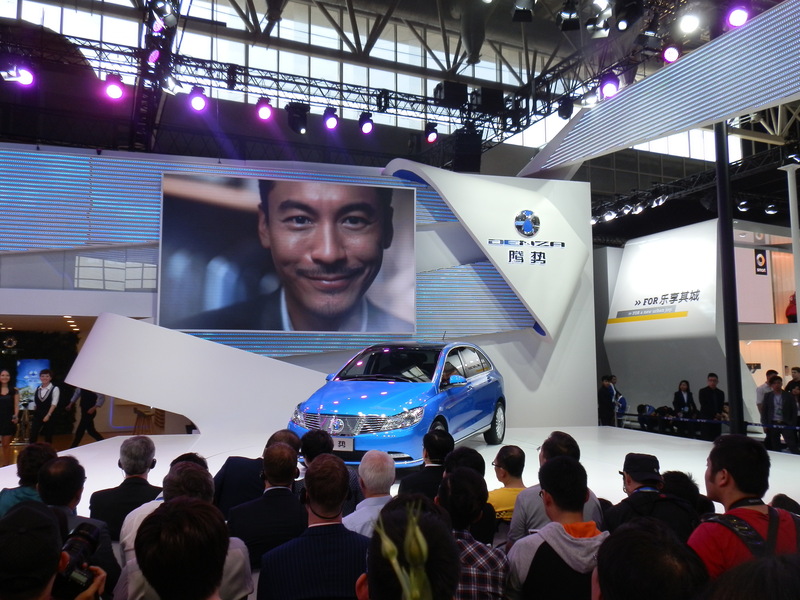 China is still struggling with how to implement a Zero Emission Vehicle-like credit program. Concurrently, it is working on a new fuel economy CAFÉ-type regulation, and aims to implement an industrial carbon credits program. As usual, China won’t simply borrow California’s ZEV program, or copy someone else’s carbon credit program. The ministries in Beijing want to come up with their own, one with Chinese characteristics. And that could be a problem. Back in November of 2014 I blogged about how China was interested in putting together a program similar to California’s Zero Emission Vehicle program, or ZEV. The program requires automakers to sell a certain number of zero emission vehicles in the state, a number determined by the total volume of vehicles that automaker sells in California, where I live. That is still a good question. A number of ministries in China have their toe in the transportation/energy policy pond. That has slowed implementation of any ZEV-type programs. As well, ZEV programs, with their multiple levels of credits for various types of low- or zero-emission vehicles – are complicated enough (just try reading the details of California’s ZEV credits regulation without having your eyes glaze over), but China wants to make such a program even more complex. It wants to combine an automotive carbon credits program i.e. a ZEV-type program with an industrial carbon credits program. A two-track carbon credits program under one umbrella, as it were. Meanwhile, a new corporate average fuel consumption program (China’s version of CAFÉ) is being created. And this is where it gets tricky. The Ministry of Industry and Technology (MIIT) is working on the CAFC standards. The National Development and Reform Commission (NDRC) is working on implementing the carbon credits program. “There is a consensus now that some form of mandate will be adopted,” said one of my sources. And there is an agreement between MIIT and NDRC that the policy should be a national one to avoid local protectionism, he says. But, MIIT wants the CAFC regulations and ZEV/carbon credits program to be part of the same policy. This is very problematic, says the source. What is the danger if China combines the two? Well, the CAFC details haven’t been worked out as to how many credits each kind of alternative fuel vehicle will be worth. And, each automaker will almost certainly have to produce a certain number of EVs to meet CARC, but Beijing is considering also requiring them to produce some EVs to meet the carbon credits requirement. The source posits a hypothetical situation that shows how problematic combining the two policy goals may be: A local automaker that produces mainly SUVs has several possible strategies. It could innovate with its ICE vehicles, using lightweight materials and the like, to improve the vehicles’ fuel economy. Or it could produce a lot of hybrids. Or the automaker could go all-in on EVs, founding its own EV manufacturing company which produces “some garbage EVs” which the automaker then sells to its own leasing company, thus meeting the quota. None achieve the government’s goal of making China a production center for high-quality EVs. Another possible outcome: The EV quota is set very high. The automaker can’t meet the quota for the stringent standards. That forces the automaker to either produce trash EVs or cheat and bribe its way into compliance. “How do you know in a mixed system what is the proper level of EV requirements for the quota?” he says. The debate continues regarding a combining CAFC and ZEV/carbon credits under one policy. I guess the good news is that MIIT and NDRC have agreed that any policy needs to be nationwide to avoid local protectionism. The bad news is it could be a bad policy.